For those of you not following March Madness, you’ve missed out on a lot of craziness. From Duke getting knocked out by Mercer to Syracuse getting eliminated by Dayton to Stanford giving Kansas the boot, lots of improbable upsets have gone down. I can’t cover it all, so I’ll be following the UCONN Huskies through the rest of their journey for now. My Boston College Eagles aren’t in the madness this year, but I grew up as a big UCONN fan, so they’ll have to do for now. Anyway, let’s reczp how the Huskies have been doing and where they might possibly end up. The Huskies drew a number 7 seed after nearly winning the ACC Tournament last week, and their first round opponents were the 10th seeded St. Joe’s Hawks. It’s important to note that Coach Kevin Ollie, who is appearing in his first NCAA tournament after inheriting a Huskies team that had been banned from tournament play last year. Ollie’s predecessor, legendary coach Jim Calhoun, hadn’t run a very academically adept program from 2007-2011, and the NCAA punished his team accordinglya. Unfortunately, Calhoun had already retired, so Ollie, who actually played under Calhoun at UCONN from 1991-1995, had to deal with that. Anyway, let’s back to the actual game, because it was a good one. The Huslkies and the Hawks battled all game long. In fact, they had so much fun battling in regulation, that they decided to play some overtime too. 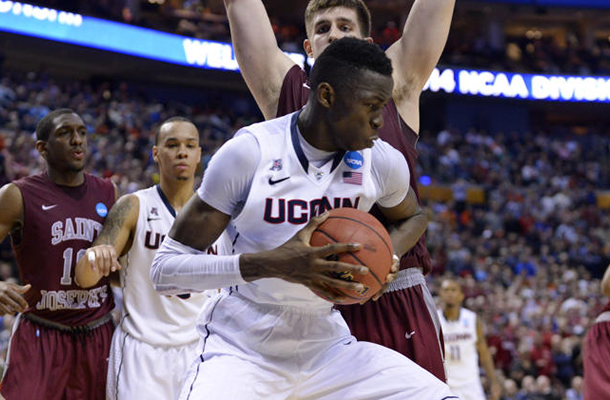 It was actually UCONN that needed the extra frame, as Amida Brimah had a three point play to for OT and keep the Huskies alive. DeAndre Daniels played well, and ended up with 18 points on the night, but the star for UCONN was, as usual, senior guard Shabazz Napier. At one point, Napier scored seven straight points in the overtime, which left the Huskies up 82-74 with 55 seconds to go. They held on for the big win. After just squeezing by St. Joe’s, The Huskies earned themselves a shot at the number two seeded Villanova Wildcats. This was a fun matchup because these two teams were once great Big East rivals, before UCONN left for the ACC (along with everyone else). Napier was the star of this one again, as he chipped in 25 points against the Wildcats. Villanova actually started this game off very well, but a 16-1 run by the Huskies late in the first half gave UCONN the one point lead at the break. They actually did that almost completely without Napier, who only had 4 points in the first half. When the second half whistle blew, it was like Napier woke up. He chipped in 21 in the second, bringing his game total to 25. Late in the game, Napier was limping and hobbling around after getting kneed or kicked in the shin, but he came back in to score some big points to put the game away for the Huskies. Villanova didn’t play particularly well, but UCONN continued their strong tradition of stepping up big in tournament time. This was a big win for Ollie and the program. 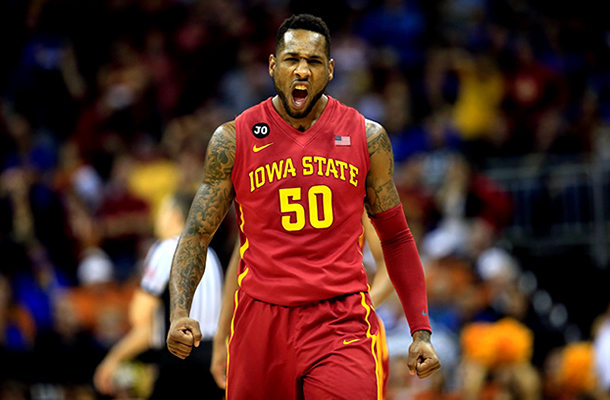 The Huskies will play their Sweet Sixteen matchup against the third seeded Iowa State Cyclones. The Cyclones are a very tough team. They feature the talents of such guys as old man DeAndre Kane (17.1 ppg, 5.8 apg, 6.8 rpg at 24 years old), senior Melvin Ejim (18.1 ppg, 8.4 rig in 2013/14) sophomore Georges Niang (16.7 ppg) and junior Dustin Hogue (10.9 ppg, 8.5 rpg). They have knocked out North Carolina Central and the North Carolina Tarheels so far in this tournament, so perhaps it bodes well for the Huskies that they play ball further north? Either way, Napier (17.8 ppg, 5.7 apg) and Daniels (12.3 ppg, 5.6 rpg) will have to keep stepping up if the Huskies are going to continue their run. I’ll be reporting more on the Huskies, and some of the other madness going on until this tournament is all over, so keep reading. Ken Hendricks liked this on Facebook. Shea Mace Brownagan liked this on Facebook.